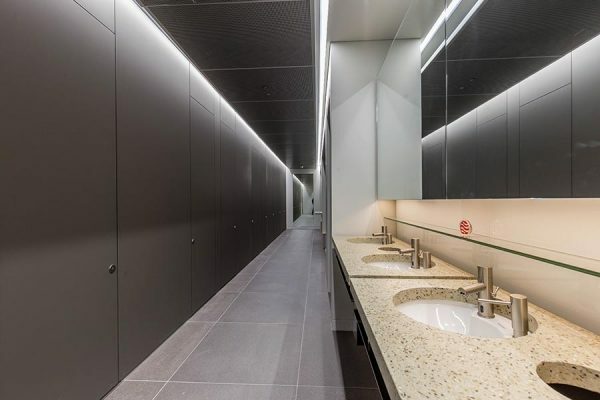 Our off-site service enabled us to deliver the perfect design solution for a high specification office washroom and changing area for this prestigious British Land project. 4 Kingdom Street, the first building developed by British Land at Paddington Central, is a landmark nine-storey building encompassing a number of wellbeing design features including outside terraces; a ‘glass pod’ delivering a creative meeting space outside of the main floorplate; and a social rooftop space including a café, bar and London’s highest rooftop basketball court. 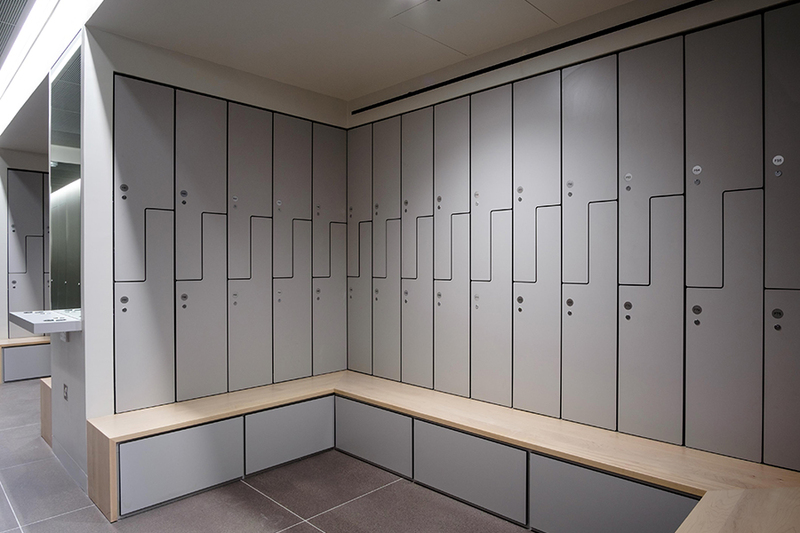 We worked closely with Allies and Morrison and main contractor Wates Construction to create the unique washrooms and showers, designed to complement the high specification interior of the building. Using our off-site construction methods, we were able to carefully fine-tune the design prior to installation on site. 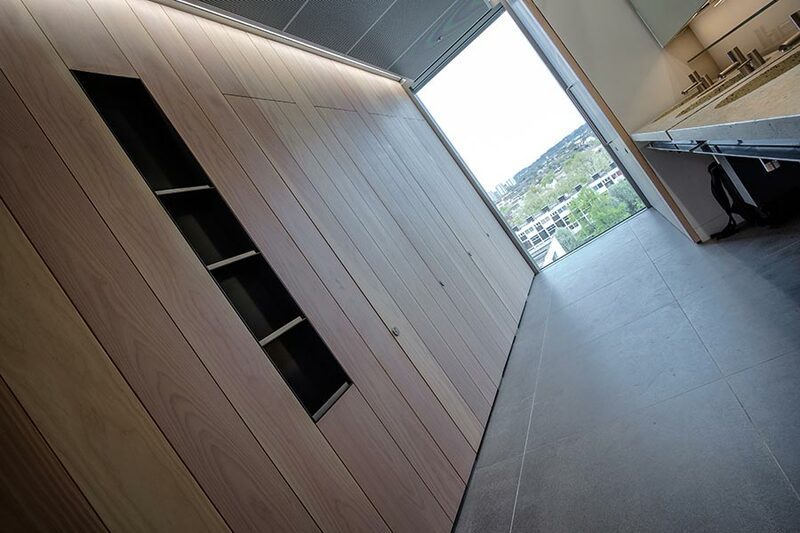 Our full height Alto toilet cubicle doors, which are a key feature of the new washroom design, were specified with a real wood veneer finish and stained to match the solid Douglas fir timber panelling in the reception area. We took the lead on this and undertook several trials, adjusting the colour of the stain until a near-perfect match for the distinctive pale grey Douglas fir was achieved. This delicate process was undertaken off-site at our factory, several months ahead of installation, saving valuable time on site and reducing the risk of costly changes to the design at a later stage. The full-size mock-ups took into consideration the placement of existing windows, doors and lighting to create an accurate representation of the finished space. We even took a photo looking out of the existing washroom window and blew the image up to the exact size of the window, allowing the client the opportunity to view the washroom as close to finished as possible. Once the design was approved, the washrooms were deconstructed and stored safely at our factory ready to be delivered to site just in time. As well as the distinctive Douglas fir real wood veneer finish, the toilet cubicle design also incorporates a bespoke iPad holder as part of the design. The full-height Alto cubicles feature a flush front design to create an attractive, virtually seamless façade – ideal for a high specification office washroom. We also manufactured bespoke vanity units with cast polished concrete tops manufactured by MASS Concrete and integral waste bins for this project. 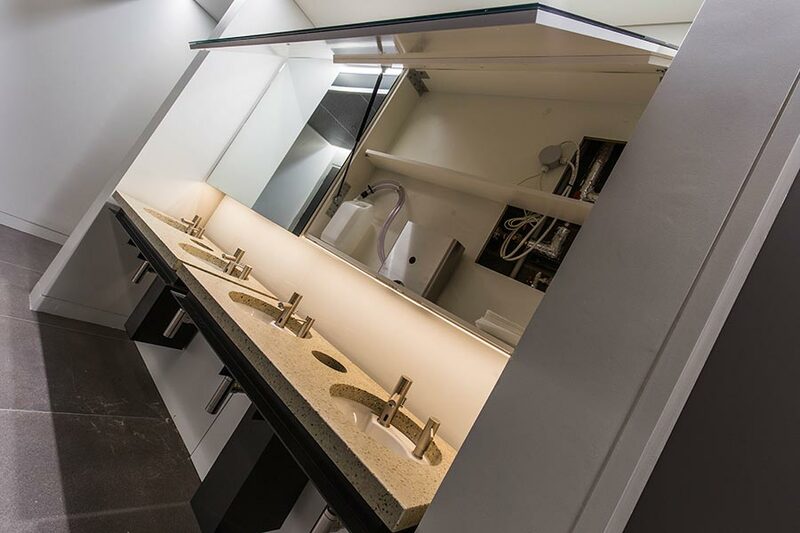 The team also installed our attractive Tego hinged mirror unit above the sinks to provide a neat and compact hidden storage solution for essential washroom consumables. The new staff shower and changing room area which we installed in the basement at 4 Kingdom Street features full height Alto FENIX shower cubicles for an ultra matt, high performance finish, along with Z style Forza solid grade laminate lockers.